As the warmer weather approaches (we hope!) and the leaves are appearing on the trees, the great outdoors calls us all to step outside and appreciate the sensory offerings of nature in bloom. 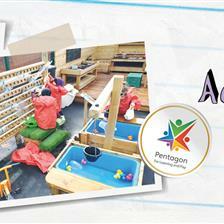 It is a brilliant time of year to expand the limits of reading lessons to include gardens and playgrounds. Children love taking storytime outside, and it creates a real opportunity to incorporate all the sensory delights around them into the book they are enjoying. By its very nature, reading is a multi-sensory experience filled with prompts to encourage imagination and exploration of sight, sound and touch. Whether working on listening skills, learning word formation, or as we discuss here, learning phonics, all literacy skills can be practiced with real joy when experienced outside. Phonics lessons form the backbone of teaching a child to read. 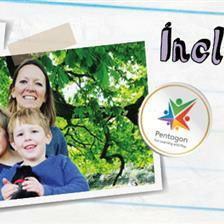 In June, Year 1 children across the country will take part in a Phonics Screening Check. The Phonics Screening Check is meant to show how well each child can use the phonics skills that they have been learning up to the end of Year 1, and to identify those children who need extra help with their phonics. The Department for Education defines the Phonics Screening Check as a “short, light-touch assessments” that take four to nine minutes to complete. They comprise a mixture of forty words and non-words that each child is asked to read on a one-to-one with their teacher. The non-words are a collection of letters that follow the phonics rules that children have been learning, but that don’t actually mean anything. Each child needs to be able to read these words with the correct sounds to demonstrate that they understand the phonics rules behind them. The non-words are presented with pictures of monsters and aliens as if the word were their name, so that the child does not become confused or think that the word is a mistake because it doesn’t make sense. The reading skills that the Phonics Screening Check are designed to measure are hugely important for not just Year 1 children, but all throughout a child’s education. Without knowing it, children are beginning to learn phonics as soon as they start to talk. As they grow and enter their EYFS years, they are learning to visualise and read the sounds that they hear. This provides the foundations of their reading skills as they go on to Key Stages 1 and 2 and throughout the rest of their lives. We have gathered together some ideas to help you keep your phonics fresh. Pick your favourite activity and join us in the garden…we’ll be there enjoying a good book! Prepare ahead and fill a large tub or box with all the essentials that you need for taking your phonics lesson into the garden or school playground. Make sure that it is easily accessible, transportable and not too heavy so on a good day (or whenever the mood dictates!) it is all ready for you to pick up at the last minute and take outside for some phonics fun. Assorted pebbles with all of the individual phonemes and graphemes marked on them in bright colours (use permanent markers), as well as at least 5 pebbles for each individual sound, with words written on them that incorporate each of those sounds. Ping pong balls and small bean bags with sounds and words written on them in the same way as the pebbles. Anything else you can think of that might be useful! From the moment you step outside, your phonics lesson can begin. Standing quietly and listening to the surroundings you will be surprised at all the different sounds that are out there! Ask the children to stand still, close their eyes and listen first, then walk or run around and see what other sounds appear. What can you hear? What sounds are the trees/birds/wind/water/people/cars/ground underneath your feet making? 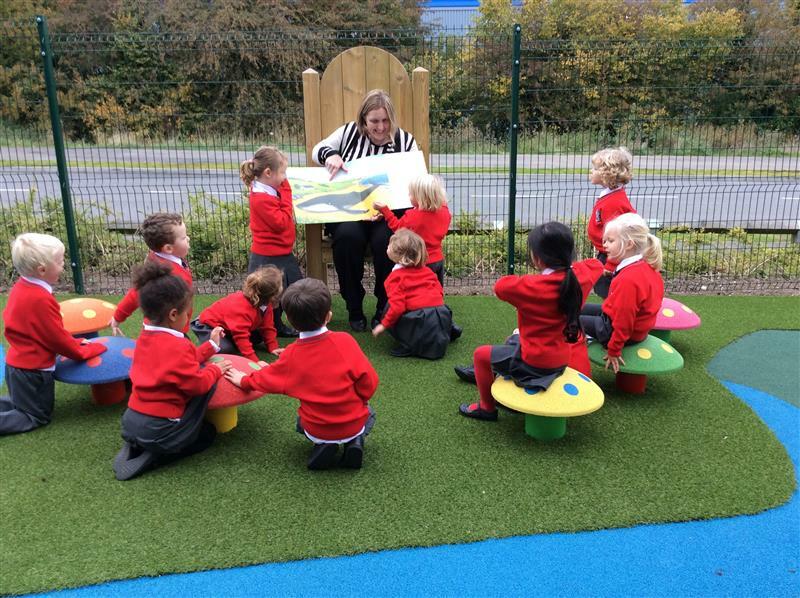 Focusing on listening to sounds outdoors will help children to use the skills that are needed for developing an awareness and understanding of phonics. Ask them to repeat the sounds they have heard out loud and see if any of the sounds are similar to letter sounds. The “sh” “oo” and “ee” of the wind in the trees, for example. 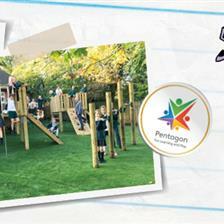 Take advantage of your school playground equipment to create a wider range of sounds. 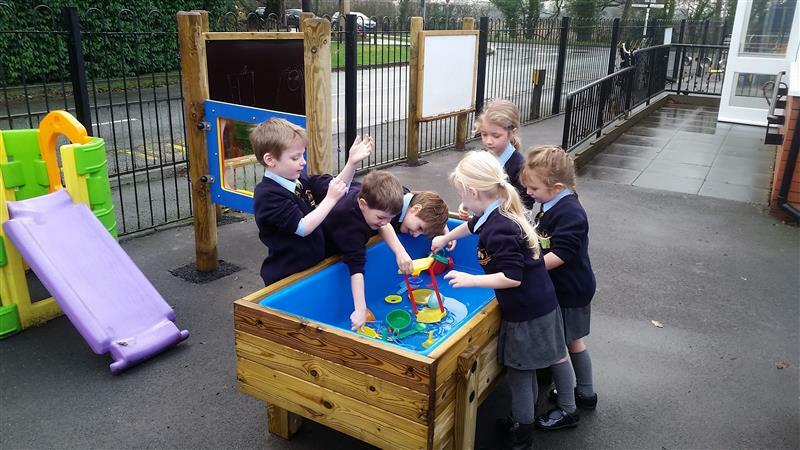 Musical Play Equipment and Water Walls are absolutely brilliant for this activity as children can make both hard and soft sounds themselves, covering most of the phonemes learned during Reception and Year 1. Say the sounds out loud then get the children to write them down in the phonics scrapbook to look at again later. Take pictures of the children at work, and of the objects containing the sounds that the children have found, and stick them in the scrapbook with their corresponding sounds written next to them. There are plenty of different games that you can play outdoors if you have a well-stocked Garden Phonics Box! Here are a few simple ideas. With each game, always ask the children to write down their findings in the scrapbook to look at together later, and take pictures to use for your visual displays. It’s all about repeating, reinforcing and making it relevant to the activities they are doing. Children can become totally immersed in learning the letter sounds if all the activities in their learning environment are linked. Hide your phonics pebbles all around the playground, in playhouses, around trees, under bridges at the top of slides, in your sand box etc. Ask your children to go hunting for particular sounds on pebbles, bring them back and sort them into the corresponding marked plant pots or tupperware boxes. Then ask the children to search for other items in the garden/playground that contain the sounds they have found on their pebbles or that rhyme with them. You can use some of the toys and objects in your Garden Phonics Box if there aren’t enough naturally occurring sounds in the garden. Once the children have found the items, ask them to arrange them around the plant pots containing the pebbles with the matching sounds. How many different things can you find for each sound and which sounds occur the most? See if they can line some of the pebbles up together to build whole words. Combine learning with water play by floating the ping pong balls in your Water Table and ask children to go fishing for sounds. Ask them to read out the sounds as they catch them or see if they can find the sounds that you call out. Can they think of a word that features the sound? Use coloured chalk on the playground floor to mark out a huge hopscotch or a long snake with the letters and sounds that you are focusing on that day/week. 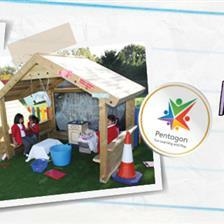 Children can have fun hopping along and shouting out the sounds as they land on them! Hang the laminated cards with string or ribbon all over your school playground equipment. Call out a letter or sound and ask your children to run to a laminated card displaying or featuring that letter or sound. Draw some big chalk circles on the ground and write a letter or sound in each circle. Ask children to sort through the beanbags to find the ones marked with words that feature the letters or sounds in the circles. See if they can throw them into the corresponding circles from a distance. Children stand together in a big circle each wearing a laminated card on a ribbon. Shout out a letter or sound and those children wearing a card featuring the letter or sound have to run all the way around the outside of the circle. The first back to their place wins! Incorporate the bean bags for throwing and catching sounds to each other. 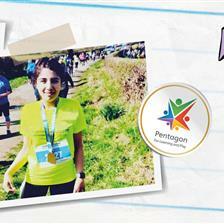 Throw a beanbag to a child and ask them to shout out the sound written on it to start their friends running! String a washing line across the playground. Call out a sound and ask children to pick out a laminated card featuring the sound from a laundry basket and peg it to the line. Alternatively hang large sheets of paper from the line and get the children having fun making a mess with paint and painting onto the paper the letters/sounds as you read them out. The benefits of learning to read outside are indisputable. 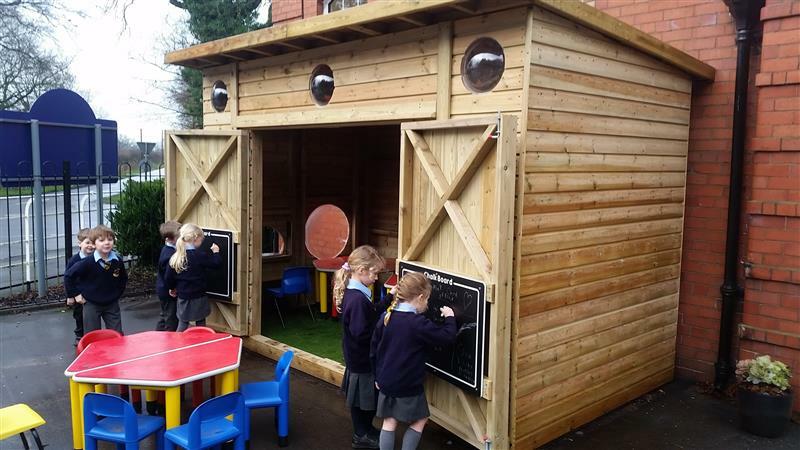 If you are looking to enhance your outdoor learning provision and provide your children with fantastic school playground equipment for phonics lessons outside, simply Contact Us to see how we can help you.